The 32 Gallon Trash cans are made of recycled plastics. These are heavy duty trash cans made to withstand the elements. 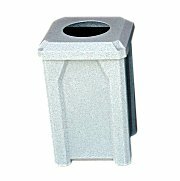 Each 32 Gallon receptacle stands approximately 38” tall and is 18” deep. Each complete unit comes with a heavy duty liner and a lanyard to secure the lid.